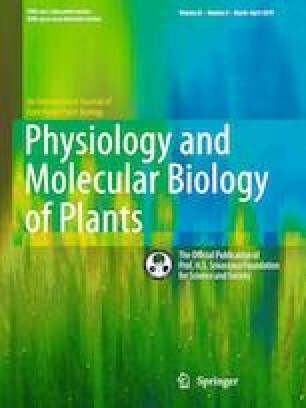 Transformed hairy root culture in common buckwheat (Fagopyrum esculentum Moench Rubra cultivar) was investigated for accumulation of amino acids and specific flavonoids. Leaves and stems of F. esculentum were used a starting material for induction of hairy roots via the Agrobacterium rhizogenes A4 strain. The transformed lines were confirmed by PCR detection of rol B gene, and their capability to continuously form hairy roots. Three lines from each explant types depending upon growth kinetics were observed. The hairy root lines were used to measure the contents of 17 amino acids and 3 flavonoids. Overall, the hairy root lines exhibited elevated accumulation of semi-essential amino acids such as lysine, isoleucine, valine, histidine and phenylalanine. Content of proline was increased 3–5 times, likely due to the biotic stress reaction induced with A. rhizogenes. Determination of flavonoids by high-performance liquid chromatography, hesperidine and kaempferol-3-rutinoside, were accumulated in hairy root cultures and didn’t detected in non-transformed root. The increase in flavonoids positively correlated with the antioxidant capacity of the hairy root cultures. Ahmed M.M. Gabr and Oksana Sytar have contributed equally to this article. Funding was provided by Agentúra na Podporu Výskumu a Vývoja (Grant No. APVV-15-0721).